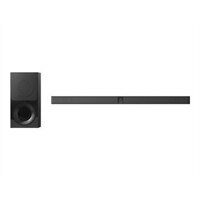 Sony HT-CT290 - Sound bar system - for home theater - 2.1-channel - wireless - 300 Watt (total) - blackBe at the center of your own entertainment universe with this 2.1 channel sound system. With a powerful output, a slim soundbar, and versatile 2-way subwoofer, you can experience cinematic sound, that revolves around you. The virtual surround sound technology puts you right at the heart of the movies you love by emulating theater-style surround sound. Enjoy a stable, high-quality audio connection for everything you want to watch or listen to, with an array of wired connections, and Bluetooth. Stream all your favorite music wirelessly from your smartphone with Bluetooth. Get the maximum impact from every bassline with the wireless subwoofer. It has a 2-way design, and you can even place it in your TV cabinet or rack for perfect home theater integration. You can stand the wireless subwoofer up or slide it onto its side, to make the optimal of your living space. Be at the center of your own entertainment universe with this 2.1 channel sound system. With a powerful output, a slim soundbar, and versatile 2-way subwoofer, you can experience cinematic sound, that revolves around you.